Hi ya'll. Lookie here an actual blog post. Gaaassssp!!!! February ended up being a pretty big month for me. While my actual scale number #screwyouscale didn't budge much my body really has and that folks was my February goal. To focus on changes in me not the scale. Goal... check! Boom! 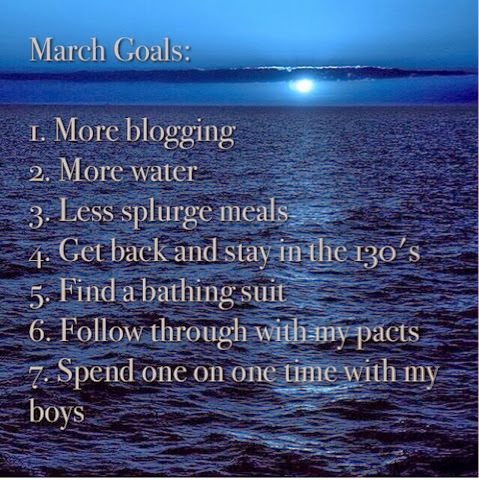 So for March I decided to make some more goals and here they are. As you see I am working on goal #1. I have been busy busy taking pics of foods and my workouts but when it comes to actually taking the 5 minutes to sit at a computer and document it for myself and ya'll someone craps their diaper or a fight breaks out between the twins and I just never do it. To say I am busy is an understatement. But I am hoping that changes going forward. Just like I take the time to work out I want to take the time to focus on this blog too. So I will be playing catch up soon with some of my February foods and some motivation. Can't wait to share them all with you. Happy Monday all! Hey btw Mondays are a GREAT day to start something new. Every good thing that has happened in your life happened because something changed. Just sayin'!